The BARBAR Professional 180 Clippers have an ergonomic shape design. A Perfect match of stationary titanium alloy blade and moving ceramic blade. 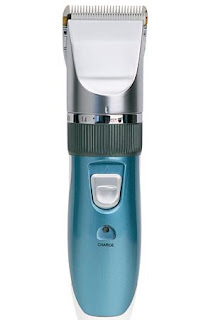 The blade is adjustable at 4 levels according to hair length. It has a Partial cover plated by chromium in addition to frosted finish for durable use. These clipper's strong power is guaranteed by a carbon brush motor. The 180 with it's high-capacity, durable fast-changing battery, and better sound designing technology is at the forefront in professional grade clippers. I am a licensed hair stylist. I don't work in the field, but I continue to offer my services to family & friends and when I work I want good tools. The bulk of what I do are clipper cuts. My good ones recently quit working. I went out and bought a $25 pair. O my goodness! The very first time I used them, we were both scared they would blow up! I was so glad to receive the Barbar clippers to review - they are like butter! You can tell they are professional upon first holding the clippers in your hand. They have a nice weight - they just feel good. They adjustable blade is great as well. I can take them low enough to serve as neck trimmers. That is a really helpful feature - not having to switch tools. I also love that they are cordless. I charge while not in use and pull free when in use. Also, if I forget to charge them, I just plug in and proceed with my cut. As you can see they are pretty too! The code blog40 receives a 40% discount off any purchase made from barbarhairtools.com. Can you tell me where your pinerest button is to share this giveaway and follow you?